Today I made it to Zumba class plus I made two (2) pumpkin pies. Good thing I went to Zumba, you know? If you are going to make pie it is best to exercise. I would take a picture of the pies except you know what, we ordinary mortals cannot take food pictures and have them look good. It seems I am always searching for recipes on the Internet and I wind up on other people's Web logs and they always have pictures of their food and it always looks gross. People who are not professionals just cannot take pictures of food, I am sorry. So, no pictures of my pies. But they look yummy! They look pretty much like the picture above. Except the crusts on my pies are more creative and homemade-looking. For some reason the crusts mixed up really well and rolled out really smoothly. I am the Leonard Pennario of pumpkin pie bakers. Speaking of which, today Howard and I stopped by the Hyatt to say hi to Jocko and we ran into our friend Joey Giambra and he let me talk about Leonard Pennario for, I want to say an hour. A long time! I told Joey Giambra I could not wait until my book was in print so I could tour the country and talk about Pennario. Meanwhile there is Thanksgiving tomorrow. 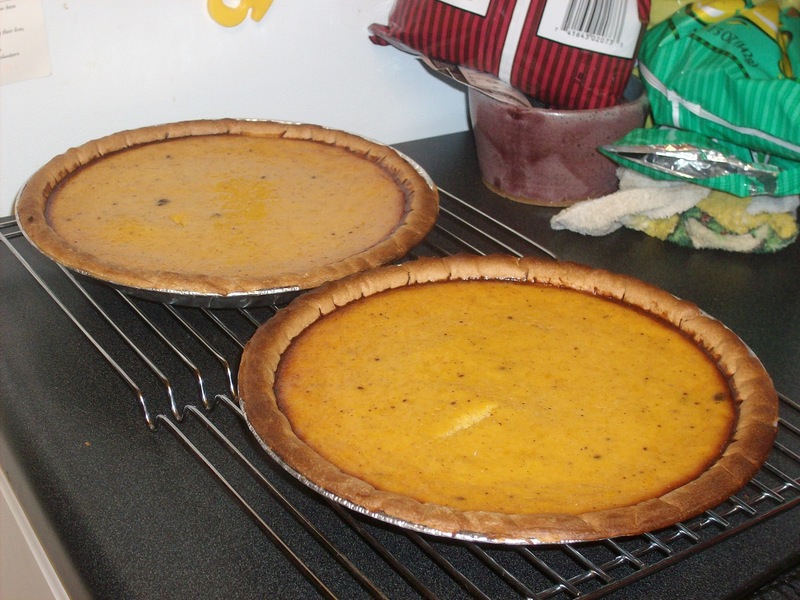 The two (2) pumpkin pies are made, if not photographed. Two (2) dressings for the turkey are also made. One is with dried bread that my brother George brought me. It was his gift! And I used it wisely. The other is with brown rice and walnuts. I am off to a good start, I think -- compared with other years. Ha, ha! I was thinking of this, there was one year I was so panicked that the Martha Stewart Everyday Food issue was lying on the counter and all I did was turn the pages and make the recipes. I just had not planned one bit. Now it was Thanksgiving Day and I had no plan and so I just kept turning the pages. "OK, what's next," I remember saying to myself. I think I made the whole menu! Things will not be that bad this year ... I think. You can never say for sure. You must hedge your bets!